Morgan St. James; Meredith Holland Who's Got the Money? With $800 Million worth of products produced in federal prisons every year, division director Abby Hamilton had a diabolical scheme to become a very wealthy woman. In fact, she had almost reached her $35 million goal when she made the mistake of hiring three savvy women who blew the lid off Pandora’s box. Despite comical backfires, Jennifer, Kate and Cameron were determined to find out what happened to missing bonus money and managed to pull off an intensive amateur undercover investigation. What they discovered was shocking evidence of something so much bigger—Abby’s clever multimillion dollar embezzlement plot. MORGAN ST. JAMES Award-winning Author/Speaker/Columnist Morgan St. James' short stories appear in Chicken Soup for the Soul books, other anthologies and The MAFIA FUNERAL and Other Short Stories. She has written over 300 published articles relative to the craft, as well as the book Writers' Tricks of the Trade: 39 Things You Need to Know About the ABCs of Writing Fiction. Her list of published novels includes the ongoing comical Silver Sisters Mystery series she co-authors with her sister Phyllice Bradner, and two dramatic novels written as Arliss Adams. She is an entertaining speaker, presents workshops and frequently appears on author's panels and radio shows. Morgan is the publisher/editor of the online eZine Writers Tricks of the Trade and is a weekly columnist for the Los Angeles and Las Vegas editions of Examiner.com. 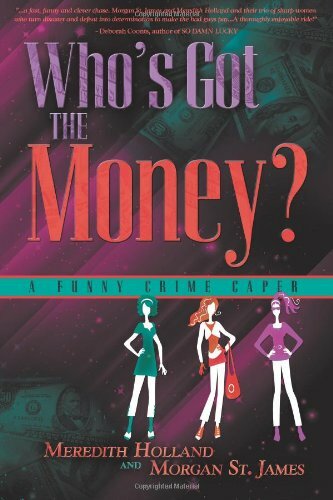 Although this funny crime caper Who's Got the Money? is purely a work of fiction, she and her co-author Meredith Holland did spend four years as part of a marketing team hired by a private sector organization similar to the marketing team in this book. They were contracted to market prison-manufactured furniture. St. James and Holland have toured prison factories and military warehouses. Morgan and her husband split time between residences in Los Angeles and Las Vegas. MEREDITH HOLLAND This is Meredith Holland's debut novel. She graduated college armed with a degree in Interior Design and designed environments including commercial spaces from healthcare and educational facilities to hospitality. Her diverse background and passion for problem solving combined with her interior design education easily qualified Meredith for the position of sales executive, marketing products manufactured by The Department of Corrections. As a marketing representative she supported the programs, products, inmate rehabilitation mission, and government policies. Meredith says she appreciated her time spent growing her region's Federal customer base and interacting with contracting agents and clients. St. James and Holland met while they were both part of the marketing team for prison-manufactured furniture and conceived the idea for this comical crime caper based upon some of their experiences. Meredith resides in Seattle, Washington with her husband and son. 1. Who's Got the Money?